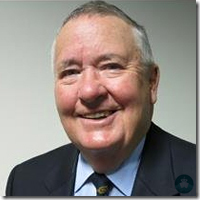 Lt Col Peter Sweeney RFD (Ret'd), MA (Mil Hist) Grad Dip Mgt (Def Studies) Dip Acc, is a retired Australian Army Reserve Lieutenant Colonel (Infantry Corps), military historian, battlefield tour guide and noted speaker on Australian military history. He completed a Master of Military History degree through the Australian Defence Force Academy Canberra campus of the University of New South Wales in 2018. 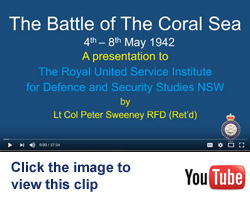 Peter has made nearly three hundred presentations on significant Australian WWI & WWII land and sea battles to a variety of community groups in Australia, including Probus, Rotary, Lions, Veterans Associations, high school students and council libraries. He is a past member of the board of the Royal United Service Institute for Defence and Strategic Studies in New South Wales and chairs their military history special interest group. Peter is an associate member of the UK based International Guild of Battlefield Guides and is co-owner of the battlefield touring company Battle Honours Australia Pty Ltd, see www.battle-honours.com.au. He has guided groups on WWI and WWII battlefields in Europe, Turkey, Asia and the Pacific. He has been a guest speaker on Princess Cruises voyages to the Pacific, Royal Caribbean voyage to Singapore, Captain�s Choice river cruise of the Western Front. As a guest speaker, Peter informs audiences of the history of strategic campaigns of both World War I and World War II as the ship cruises near the battlefield sites. Peter uses informative PowerPoint presentations, including maps, diagram and photos, which cover the Strategic Plan, Opposing Forces, the Battles, Analysis and Aftermath of each campaign. Greece was initially invaded by Italy in 1940, but Greece repulsed the initial Italian attack and a further attack in March 1941. In April 1941 German troops invaded from Bulgaria, creating a second front. Reinforcements of British, Australian and New Zealand forces proved inadequate. The Greek army found itself outnumbered in its effort to defend against both Italian and German troops. The Metaxas defensive line was quickly overrun by the Germans, who then outflanked the Greek forces at the Albanian border, forcing their surrender. British, Australian and New Zealand forces were overwhelmed and forced to retreat, with the ultimate goal of evacuation. For several days, Allied troops played an important part in containing the German advance on the Thermopylae position, allowing ships to be prepared to evacuate the units defending Greece. The German Army reached the capital, Athens, on 27 April and Greece's southern shore on 30 April, capturing 7,000 British, Australian and New Zealand personnel and ending the battle with a decisive victory. The Battle of Crete was the first mainly airborne invasion in military history with Fallschirmj�ger (German paratroops) used en masse. It was also the first time the Allies made significant use of intelligence from decrypted German messages from the Enigma machine. The Germans had suffered heavy casualties but were able to capture Maleme airfield. This enabled the Germans to land reinforcements and overwhelm the defensive positions on the north of the island. Allied forces withdrew to the south coast. Over half were evacuated by the British Royal Navy; the remainder surrendered or joined the Cretan resistance. The invasion of Sicily in August 1943 was a precursor to the allied invasion of Italy. It began with a large amphibious and airborne operation, followed by a six-week land campaign. The US 7th Army led by Gen Patton and the British 8th Army led by Gen Montgomery advanced along opposite coasts and drove Axis air, land and naval forces from the island by the end of August 1943. This resulted in the opening of the Mediterranean sea lanes for Allied merchant ships, the toppling of Benito Mussolini, was toppled from power in Italy and forced Hitler to cancel a major offensive at Kursk to divert forces to Italy, resulting in a reduction of German strength on the Eastern Front. Following the capture of Sicily, the Allies invaded Italy in September 1943. The operation was undertaken by Gen Sir Harold Alexander's 15th Army Group, comprising US 5th Army (Gen Mark Clark) British 8th Army Gen Bernard Montgomery) and followed the successful invasion of Sicily. The main invasion force landed around Salerno on the west coast while two supporting operations took place in Calabria and Taranto. The main landing was nearly defeated by German counter attacks. The advance up the spine of Italy was slowed by the terrain and German defences such as those at Monte Cassino. A strategic mistake was made by Gen Clarke in focusing on the capture of Rome rather the destruction of the German 10th Army. German resistance in Italy did not end until May 1945. The aim of the invasion of southern France in August 1944 was to secure the vital ports on the French Mediterranean coast and increase pressure on the German forces by opening another front. After some preliminary commando operations the US VI Corps landed on the beaches of the C�te d'Azur followed by several divisions of the French Army B. Hindered by total Allied air superiority and a large-scale uprising by the French Resistance, the weak German forces were swiftly defeated. The Germans withdraw north through the Rh�ne valley, to establish a stable defense line at Dijon. Allied mobile units were able to overtake the Germans but neither side able to achieve a decisive breakthrough. The Germans were finally able to complete their withdrawal and while the Germans were retreating, the French managed to capture the important ports of Marseille and Toulon, putting them into operation soon after. After the Second Armistice at Compi�gne between Germany and France on 22nd June 1940, the only continental ally of Britain had been replaced by a government administered from Vichy, which inherited the French navy. The British feared that the Vichy government would hand the ships to the Kriegsmarine despite assurances from the commander of the French Navy that the fleet would remain under French control. The British War Cabinet ordered the Royal Navy to either intern or destroy the French fleet at Mers-el-K�bir in Algeria. An ultimatum to surrender his fleet was refused by the French naval commander. The Royal Navy bombarded the French ships and killed 1,297 French servicemen, sank a battleship and damaged five ships, for a British loss of five aircraft shot down and two crewmen killed. The Gallipoli Campaign, was an attempt by the British to force Turkey out of the Central Power Alliance with Germany and Austria-Hungary. Initially, in March 1915 the Royal Navy endeavoured to force passage of the Dardanelles, a strait that provided a sea route to the Russian Empire via the Black Sea. The assault failed due to Turkish naval mines with the loss of three battleships with three others severally damaged. There followed amphibious landings at the end and in the middle of the Gallipoli Peninsula. Despite establishing bridgeheads at both locations, British Australian and New Zealand troops were unable to capture the heights above the Narrows. After eight months fighting the British evacuated. The campaign gave rise to the ANZAC tradition in Australia and New Zealand.